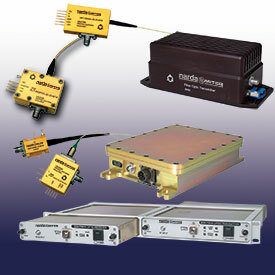 L3 Narda-MITEQ designs and manufactures a broad range of high-quality Fiber Optic Links. These fiber optic links can include: small compact size, bandwidths from 5 kHz to 18 GHz, low noise, high dynamic range, cooled and un-cooled DFB laser, plug and play so there are no external control circuits required. Our Fiber Optic Links include a transimpedance amplifier in both the fiber optic transmitter and fiber optic receiver. These fiber optic products include operational status monitor pins and much more. L3 Narda-MITEQ's Fiber Optic Links are Ideal for both IF and RF signals, communication systems, antenna and local oscillator remoting, delay lines, digital and cellular signals, GPS antennas, internet towers to name a few. L3 Narda-MITEQ can customize the electrical specifications and packaging of all our fiber optic receivers, fiber optic transmitters and fiber optic link pairs to meet your specific requirements. So let L3 Narda-MITEQ be your custom fiber optic solution. FDA/CDRH Class I laser products. All transmitter versions of the fiber optic component enclosures (Option EI, WP, SE, and ME) manufactured by L3 Narda-MITEQ are Class I laser products per the CDRH, 21 CFR 1040 Laser Safety requirements. Furthermore, all transmitter versions of the fiber optic component enclosures are Class 1M laser products per IEC 60825-2.